If you have been painting scenes of mass demonstrations for a number of weeks, you will definitely get a good grasps of its nature. After all, painting in oils and canvas takes plenty of time, as well as an uncanny eye for detail. 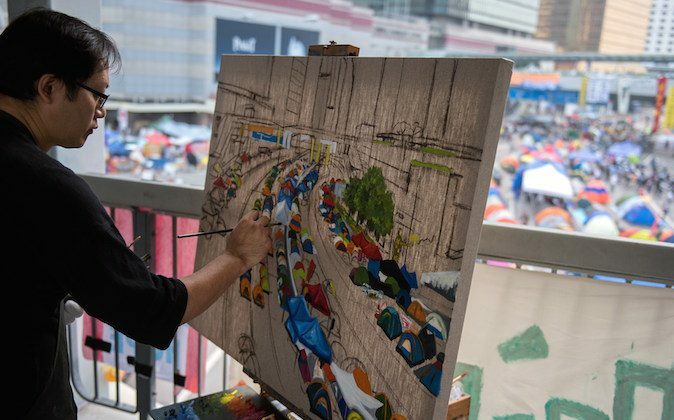 Hong Kong documentary artist Perry Dino has been capturing the Occupy Central pro-democracy protests on canvas since the mass pre-protest rally on Aug. 31, and from where he’s painting, the protests proving to be standout examples of how to engage in civil disobedience. “I think Hong Kong citizens should feel proud (of the Umbrella Movement’s nonviolent nature),” Dino added, and hopes that people around the world can also show their “support and encouragement” to the peaceful protesters of Hong Kong. Dino has been capturing Hong Kong protest scenes since the 2012 protest against Beijing’s attempt to foster “patriotic education” in Hong Kong schools. “These are hugely important events that will go down in Hong Kong history,” said Dino. Dino, who is also a part-time teacher of visual arts, plans to donate the paintings to a local museum some day so that future generations will know their history. With characters like Mr. 4PM and Mr. Rubbish Bin, who can possibly dislike the Hong Kong government?